How companies are dealing with Corruption. 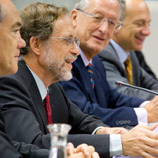 17 September 2009 – A new publication launched in Vienna today profiles the anti-corruption policies and measures of the Fortune Global 500. The report, issued by UNODC in cooperation with PricewaterhouseCoopers, collects existing practices used to prevent corruption in some of the world’s biggest companies. It highlights a range of measures, and different approaches. 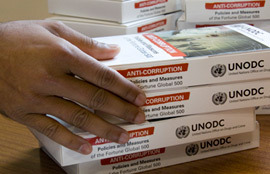 “There is no one-size-fits-all set of rules to prevent corruption, but businesses should not go below international standards contained in the United Nations Convention against Corruption”, said UNODC Executive Director Antonio Maria Costa. Friedrich Roedler, Senior Partner of PricewaterhouseCoopers Austria, stressed that “leaders and managers must set the tone from the top by enforcing a zero-tolerance policy”. At the launch, which included a panel discussion chaired by Haig Simonian of the Financial Times, participants underlined the need to identify good practices, and get companies to apply them. The importance of measuring compliance was also stressed. “Too often there is a big gap between what companies say and what they do, especially when large amounts of money are at stake”, said Mr. Costa. “The private sector has a lot to lose from corruption, and has considerable leverage to stop it”, said Mr. Costa. He urged business leaders to attend the Global Forum on Fighting Corruption and Safeguarding Integrity, to be held in Doha on 7 and 8 November, as well as the third session of the Conference of States Parties to the United Nations Convention against Corruption, which will also take place in Doha, from 9 to 13 November. “This will be a golden opportunity to strengthen corporate responsibility in line with the world’s only universal anti-corruption instrument”, he said. The UNODC Marketing Toolkit by creative images. Having collected existing practices, the next step is to highlight good practices and have them widely applied. Click here to see the Original Post from the UNODC website. The full report is available on the UNODC website and on a memory stick.